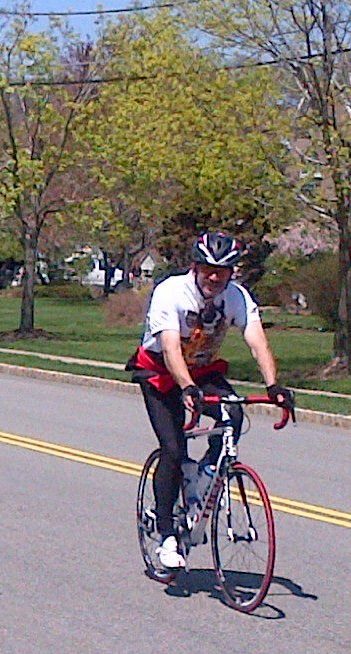 There was a time, a long, long time ago when I might ride 60-70 miles in a weekend. I certainly rode well over 100 miles in a week many times. It has been a long time since I have ridden so far in a weekend. I did it this weekend. On Saturday I rode 52 miles (as mentioned) and yesterday I did an easy 18+ to keep the legs limber. I expected to be a little leg-weary today. I wasn’t. I feel great! The legs feel normal. I was up and down stairs today with no sense of stress or effort. After weeks of cold and wet and dismal weather, we had a wonderful weekend. Bright sunshine, morning chill giving way to 70-degree afternoons. The Saturday ride started out chilly but soon warmed nicely and with little wind we were all able to enjoy a good spring ride. That afternoon we grilled dinner and ate on the deck. On Sunday, Missus and I went out and did some shopping and enjoyed each other’s company. We shopped at a little gourmet grocery store and picked up a baguette, some roasted eggplant, some corn and bean salsa, some salmon…. I went for the 18 mile ride after we came home and when I returned I smoked the salmon and we had roasted vegetables and the salmon with the salsa and the roasted eggplant for dinner. Dessert was fresh pineapple. Somewhere in all this Missus and I went shopping and bought flowers for the front of the house and I planted marigolds, posies and a variety of daisies along the fence. All in all? I couldn’t ask for a better weekend. It has been a big deal to me. Someone took a handful of pictures of the ride on Saturday and posted them on Facebook. Nice pictures of a fun ride on a beautiful day. I am in three or four of the pictures. Here is what stood out to me about the pictures I am in: I don’t stand out. I don’t stand out. Let that sink in for a second. When you are 100+ pounds overweight you stand out. You are the focus of every photograph. Even standing in the back, hiding behind three or four skinny people, you stand out. I have stood out in pictures for so many years…. In pictures of family events. In pictures of a casual get-together. In candid shots. In formal shots. I stood out. In these pictures I stand out to me because I don’t stand out. I look like I belong. I look “normal”. I look unexceptional. I look like everyone else on the ride. I am wearing my cycling tights and my cold weather jersey and I look just like everyone else on the ride. Later in the pictures I have taken off the cold weather jersey and I have on my regular short-sleeved jersey and I looks just like everyone else. I am still letting that sink in. The Five-Boro Bike Tour is next Sunday. I will spend this week staying healthy and preparing for the ride. I MIGHT get in an evening ride this week if the schedule and the weather permits. Mostly I will stretch, walk, rest and eat right. And I will stay away from anyone who sneezes or coughs. Categories: bicycling, Cooking, Cycling, Emotional Well-being, Father-Son, fitness, Friendship, Knee Injury, Proper Nutrition, Vegetarian, weight loss | Tags: Cycling, exercise, Father-Son, fitness, healthy-living, humor, Vegetarian, weight loss | Permalink. From someone that has lost 100+ pounds , regained them and is trying to lose them again – NEVER let anyone take your sense of accomplishment away!! You have succeeded at something few do and are doing a phenomenal job at maintaining it. Have a fabulous time blending in at the Five Boro. Now you’ll have to get a special shirt to be seen in the pictures. Happy Cycling! I love it! Not standing out, the way you speak of it, is something I always struggled with, and it’s such a great accomplishment. Be proud!